My aim is to bring nature (through my work) to those who can benefit most. Locations might include elder-care facilities, health and wellness clinics, hospitals and hospices. Any place where people have a need for the restorative effect of art. Landscapes are fluid; skies threaten, clouds move, grain sways, trees rustle. A city scape is frenetic with abstract traffic. Mist rises and a path beckons one into the scene. The canvas is attacked with knife and brush and enthusiasm. Ten years ago, I made a decision to focus on what I love, painting my home state and the magic that is uniquely Florida. I want to share all the beauty surrounding me. Taking dictation from the Creator, I learned to accept each brush stroke as a gift. Not to mess with it but to accept it as gift given, however imperfect it may appear. I try to infuse my paintings with the passion and love I feel towards nature and creation. 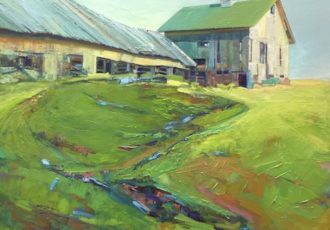 I do this through dynamic composition, juxtaposition of bold brush and palette knife work, textural passages and notes of unexpected color. I think this is a great time to be a watercolor painter for we have so many wonderful toys from which to choose—new paints, new paper and the like. I have been told that the term that best fits my work is Contemporary Impressionism and I quite like it. It is representational but not realism. 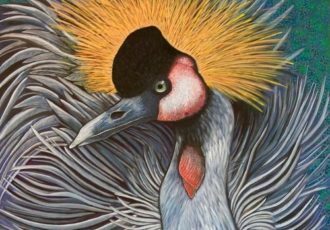 From mixed media to oil, photography, watercolor and even finger painting, the following artists share their passion for art by showcasing one of their favorite pieces of art. I am especially fascinated by how watercolor can depict reflections so effectively and am so fascinated by it that I may enjoy painting the rippled reflections even more than the actual objects themselves. My goal is to interpreting the amazing flora and fauna of this country (Australia) with my individual style and share it with the rest of the world. I have never been very interested in the technical side of photography. Cameras and lights are only the tools used to make an image. Analog or digital—who cares—it all depends on the final result that I am looking for. As a native Floridian, I’m drawn to the elusive nature of our skies with a curiosity that is unending. I feel as though nature provides us with a thousand different paintings every day in the ever-changing sky. I love that I can create another view of a landscape that not only conveys my feelings and emotions, but perhaps allows the viewer to experience the scene in another way by seeing the different colors I use—colors that don’t appear to the naked eye. Single pigmented paints, many of which are transparent in nature, are among my favourites. Layer upon layer is built on the canvas, combined with inks and watercolours. The transparency allows each layer to peek through to the one above.